Kitchen makeovers remain popular as homeowners continue to invest to create a warm, stylish, comfortable, and efficient heart of the home. In addition to improved aesthetics and organization, kitchen remodels also hold reasonable resale value. According to Remodeling magazine’s 2011-2012 Cost vs. Value Report, midrange minor kitchen remodels—new countertops, appliances, cabinet fronts, and hardware—have an average national cost just shy of $20,000 and get 72% return on investment. Midrange major remodels, which include new appliances, cabinets, countertops, flooring, and lighting, have a mid-range average of $57,824 and a nearly 66% return. High-end renovations can easily cost $100,000 and up. Today’s kitchens average 200–300 square feet and are increasingly part of an open-floor plan. Other trends include a move towards simplicity, uncluttered looks, energy efficiency, and natural materials. Look to design books, magazines, and websites for ideas. And check out the helpful Kitchen Planner by the National Kitchen and Bath Assocation (NKBA), which is available as a free download. Stop the clutter. Now is your chance to take inventory of everything you need to store, then plan accordingly. Fortunately, cabinet makers realize storage and organization features drive sales, and they’ve responded accordingly. • The Work Station. Create separate stations for food prep, cooking, baking, and cleaning. 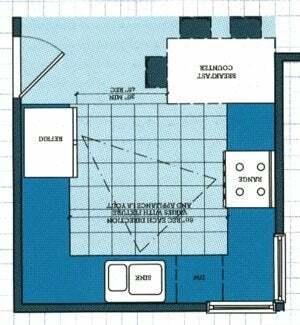 Each area is centered around a major appliance and needs at least 15 inches of counter space. As for budget breakdown, the NKBA Kitchen Planner notes that you can expect cabinetry and hardware to run about 29% of your investment, appliances and ventilation can be 14%, countertops typically run 10%, and installation is about 17% of the total project cost. Set aside 10% or 20% of your budget for contingencies.